If there’s one notion that will define the decade early 2010s in startupland, it’s the Megaround, the investments of greater than $40M in private companies. Historically, startups needed to trade on public exchanges to access sums of money from $40M to several billion. But today, the private markets are providing this capital. These billions of dollars, which amount to about half of all venture investment, skew substantially towards consumer investments. The green bar chart above compares how private investors allocate their dollars. 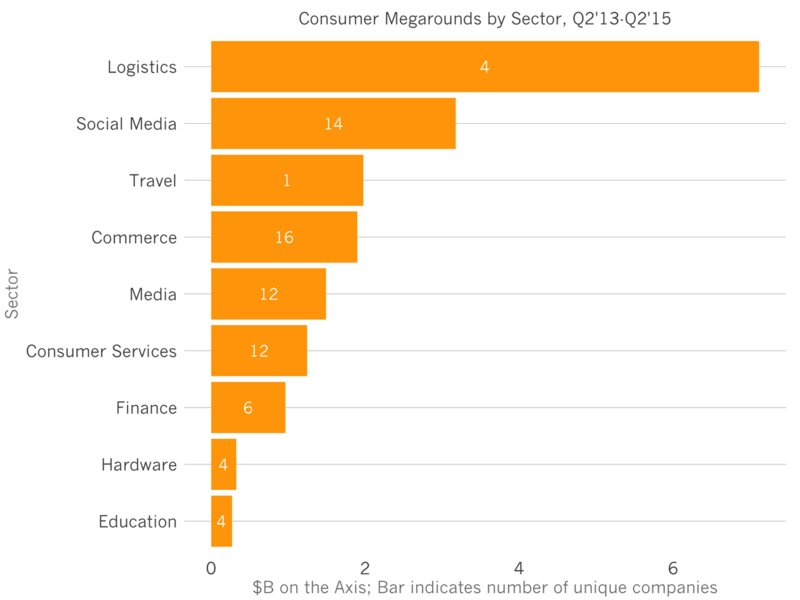 Consumer startups fetch 50% of megaround dollars. 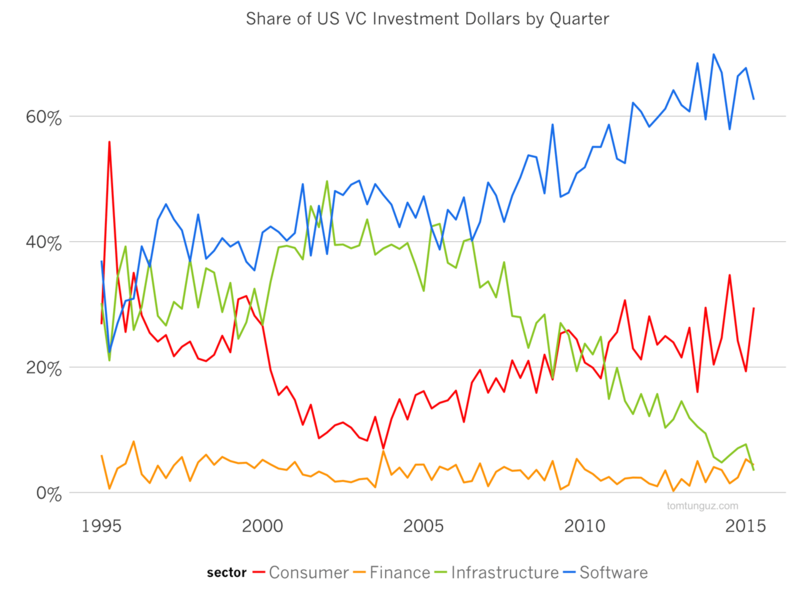 Software companies collect 40%, then 7% for Infrastructure and 4% for Finance. Let’s contrast these figures with the total US venture investment market. Overall, Software startups win about 60% of dollars, compared to 30% for Consumer, and the remaining two categories account for the remainder. Why do consumer companies command three times as much capital on a relative basis in the later stage private markets than in the market broadly? It’s because the market caps for public consumer startups are 5x larger than their software counterparts. 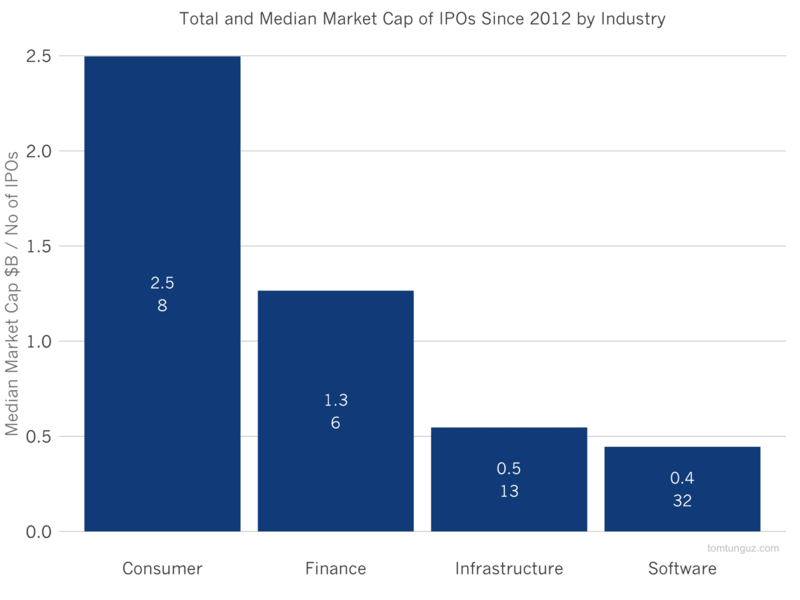 The chart above plots the median market cap for IPOs since 2012 by industry. In the past 3 years, 8 US VC-backed IT consumer companies have gone public and have achieved a $2.5B median market cap ($2.2B if we exclude Facebook). This compares to $400M for software companies, of which there were 32. Though there are some very large software companies (Workday, $15B; ServiceNow, $12B; Splunk, $9B), 14 of the recent IPOs are worth less than $400M as of this writing. One could argue there is a sample bias in the data set. Many of the most attractive companies prefer to raise in the private markets, rather than the publics. But, given how much the private markets seem to favor consumer companies, this bias should depress the consumer figures more than the enterprise ones. In consumer megarounds, logistics companies including Uber, Lyft, Postmates and Shyp collectively have raised more than $7.1B in the last 24 months. Uber accounts for an astonishing $6.1B of that $7.1B. Social media companies like Pinterest and Snapchat follow closely behind. Then AirBnB dominates travel, having raised more than $1B in the last few years. And so on. In software, companies selling to IT have raised the most capital, then marketing, then HR, which is close consistent with software outcomes.. 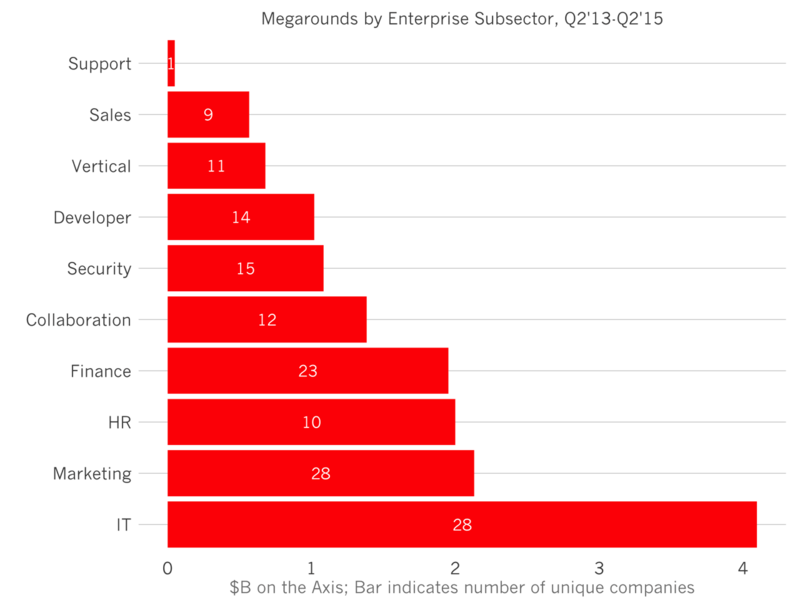 Surprisingly, Sales focused companies trail at the bottom of the list. I suspect this is the consequence of Salesforce’s dominance in the category. 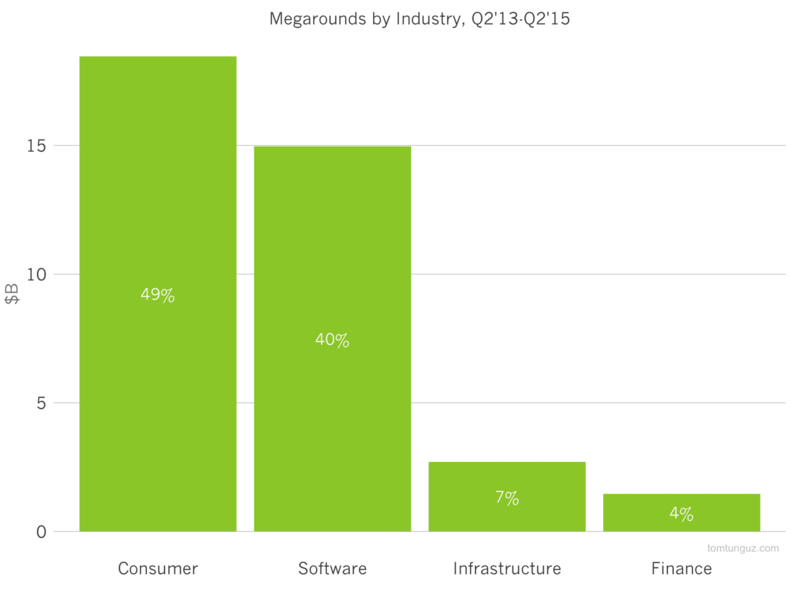 In summary, consumer startups raise the near-super-majority of late stage venture dollars. Allured by the promise of 5x larger IPOs, megaround investors pursue these companies aggressively.